I actually don’t have a ding-dang thing to write about, nor do I have time to write it. I’m leaving in just a little smidge to go to two friends’ Big Numbered birthday party in Wisconsin, and you are kidding yourself as much as I’m kidding myself if you think I’m packed and/or ready to go. But good God, y’all. Remember when I didn’t write about the misery of Israel/Palestine every.single.dang.day? I do. Barely. I miss those times. They were good. Good times. I learned on Monday that African Americans broadly share a stereotype of White Americans that we do not use washcloths — “just soap on body!” as one Twitter friend put it. I was gobsmacked, and protested. And tweeted out a picture of the washcloths in my linen closet because this calumny shall not stand. In the past week I’ve read Virginia Woolfe’s biography of Elizabeth Barrett Browning’s dog, Flush, and Austen’s Sense and Sensibility (first time), and Bradbury’s Fahrenheit 451 (I thought I’d read it before but now I’m not sure…?) and they were all delightful! (Though I had some real issues with Bradbury the writing is so… I mean, just wow… that I couldn’t help but drown in it anyway). The first two items came nicely full circle on Wednesday when I reached page 10 of my current book, The Girl Who Fell from the Sky, whereupon I read “white people don’t use washrags,” and though the book is beautiful and more than a little heartbreaking at this point, I laughed out loud. Vikings punter and over-all-swell-guy Chris Kluwe called out a racist for being a “racist shitpickle” yesterday and I have determined that I must add this word to my vocabulary. Post haste. I mean: Shitpickle! Posted in Good Stuff, Mental Rambling, Squee! Friday open thread – until the Return of the Khan should deem otherwise. As a long-time observer of Israeli government policy vis-à-vis the Palestinian people, I don’t understand why Israel’s leaders feel they must loudly trumpet their opposition to Palestinian statehood and/or basic rights. On any given day, we get to hear that virtually anything Palestinians do or say is The! Worst! Thing! Ever! (and, of course, woe betide any who might venture the opinion that, hey, maybe not). I say this because, as per the usual, the hyperbole surrounding yesterday’s statehood vote at the United Nations General Assembly was a thing to behold: Palestinian President Abbas’s decision to go to the U.N. was “pure diplomatic terror”! His speech was “venomous”! Members of Knesset try to burn the Palestinian flag! Yet if we’re to be brutally frank, bluster and threats are entirely unnecessary. Israel doesn’t need to convince the world of its position or to take extreme measures to make sure that Palestine’s nascent statehood dies in the cradle. All Israel needs to do is stay its decades-long course and keep sending out bulldozers. Witness the report that Israeli Prime Minister Netanyahu’s morning-after response to the statehood vote is 3000 new housing units in the West Bank and East Jerusalem, as well as expedited work in the E-1 “envelope,” a development project intended to geographically join Jerusalem to the settlement of Maaleh Adumim and thus cut the West Bank in half. And thus destroy territorial contiguity for any Palestinian state. And thus drive a final nail in the coffin of the notion of two-state peace. Though impressive in scope, there is, in fact, nothing new in these plans—indeed, even though Netanyahu committed to President Obama upon taking office that he would not build in E-1, that piece of it can’t be considered a breach with the past either. After all, Israel is forever promising the U.S. one thing and then doing quite another, in particular with regard to the settlements. Government of Israel immediately dismantles settlement outposts erected since March 2001; consistent with the Mitchell Report, GOI freezes all settlement activity (including natural growth of settlements). Despite the construction freeze, dozens of settlements in the West Bank are experiencing a building boom… According to data collected by Dror Etkes of Yesh Din, and by Hagit Ofran of Peace Now, construction is being carried out in more than 50 settlements and in two other industrial zones. And just in case anyone’s harboring any doubts about what might happen after Israel’s upcoming elections—the results of the recent Likud primaries should serve as a bracing corrective. Yesterday’s UNGA vote was a historic moment, and who can tell but some lasting, tangible good may come of it. I don’t know how individual Palestinians are feeling about their nation having achieved “non-member observer state” status. Honestly, if it were me, I imagine I might have wept last night, and possibly thrown a party. But I’m not Palestinian, and from where I sit, the vote hardly matters. Unless and until the international community, and at its head the President of the United States, should decide to hold Israel to international law and its own signed commitments, a right-wing led Israel will continue to take daily unilateral action to change the facts on the ground so that a viable Palestinian state becomes a literal impossibility. Palestine vote at the UN General Assembly – sources. I have NO TIME — I have an actual, factual deadline here — but I’m of course obsessing about the Palestine vote at the UNGA, even though that’s not what I’m supposed to be writing about (international labor and safety are very worthy topics, Contract Client! Just not what I’m thinking about today). However, I figure folks might be coming here for a little clarity on the event, so I thought I’d throw up a rolling post with sources, adding as I find new ones. My Twitter list of sources I follow for issues Israel/Palestine/Middle East – it’s not in the least exhaustive, but it’s a good place to start if you just want to take a peek at what’s going on and what the mood is (it’s worth noting that all of Syrian internet has been shut down and the Damascus airport has no flights in and out or, indeed, radar today – all very, very bad signs, so that’s something else to keep an eye on, too). update: JJ Goldberg in The Forward: Who Stands Against Peace? Palestinians Are Sounding Reasonable as Israel Drifts Right. The final tally: 138 voted for upgrading Palestine to “non-member observer state” status, 41 abstentions (including Germany and Holland), and nine “no”s. Click here to see the list of how each state voted. I’ll be back at my machine soon, but for now am posting from the road. Fingers crossed that it works- have at it! Space flight and the average mortal. I know this may come as a shock to some of my readers, but I often have Opinions. About, you know: Things. One of these Opinions essentially boils down to: There is an invisible line in the sand for every expenditure a person can make, and when that line has been crossed, spending That Much Money becomes irredeemably silly. You have $96 to buy a leather jacket for your infant? Maybe you should give it to the poor. Planning dinner at a place where the prix-fixe menu runs $500 a pop? Give it to the hungry. And I don’t care how rich I ever get, I will just never be able to spend $1,000 on a pair of shoes. If the following (via io9) becomes a reality for average mortals before I shuffle off my mortal coil, and I someday have however many tens of thousands of dollars it will probably cost for an average mortal to avail him/herself of it? I will do so. In a heartbeat*. It’s been a while since we last reported on the British Skylon space plane — a reusable launch vehicle that will be powered by a two-in-one air-breathing rocket engine that can boost the plane to Mach 5.5 and a height of nearly 30 km (18 miles). The latest news is that the theoretic Sabre Engine ain’t so theoretic anymore; it passed a critical heat tolerance and cooling test — what will now pave the way for Skylon to move from concept to reality. Because of the successful test, Reaction Engines Limited, the British company working on the engine, won an important endorsement from the European Space Agency. …Once fully developed, the Skyplane will travel five times the speed of sound and reach an altitude of nearly 30 km — what is 20% of the speed and altitude required to reach orbit. To make it all the way into space, the plane will switch to rocket mode. The Skylon will, in theory, be able to make a trip to space, drop off something like a satellite, and then return to its port all while being controlled remotely. However, REL has conceptualized a passenger version of the Skylon, so the dream of leaving a spaceport for a quick jaunt amongst the stars is still a possibility. What can I say? In.a.heartbeat. *May also apply to Arctic travel. Jury’s still out. Your Tuesday WEDNESDAY* open thread. Sorry, bee tee dubs, that the open thread names have gotten so boring. Given how infrequently the Khan is indulging us over at the mothership (he’s a Khan… the motherhorse? ), I realized it might be easier to make sure people know just which thread they’re looking for/at. In other news, it’s yours…. *PS: Welcome to my week! 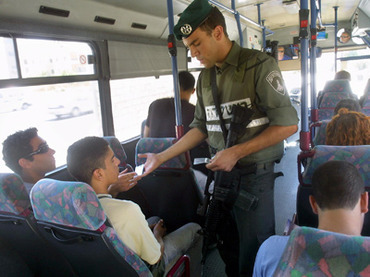 An Israeli border guard checks IDs on an Israeli bus. In the hierarchy of Things That Are Bad, rockets and bombs flying/being flown across borders is right near the top. It’s possibly unsurprising, then, that no one has had much to say about the West Bank lately, other than to note that the Ramallah-based government of PA President Mahmoud Abbas is in trouble. The Transportation Ministry says it is considering adding bus lines between West Bank roadblocks and central Israel; these would be geared toward Palestinian laborers. Anyone who knows anything about the occupation knows that it boils down to an enormous system of racial profiling, wherein Living While Palestinian is a suspicious act. Yet it is occasionally enlightening to see that attitude given such clear and unequivocal expression. To wit: Palestinian laborers who have been granted a work permit by Israel’s extensive, exhaustive, and frankly Byzantine permit system—that is: laborers who have been vetted and re-vetted and likely re-re-vetted by the Israeli military itself—are a security risk, by virtue of their being Palestinian. Not so much of a security risk that we can’t let them perform manual labor for us, of course, but God forbid we ride the same buses! Commenters left offensive responses…with one referring to the Palestinian passengers as terrorists and another as monkeys. And so yes, the very idea of establishing one bus line for Jews and another for Palestinians is appalling. And racist. And unfair. And wrong. But here’s what it’s not: Shocking. Because this is what occupation looks like. Appalling. Racist. Unfair. And wrong. Ehud Barak: Brash, brilliant and tragically blind to his own shortcomings. He is, in a nutshell, the story of Israel itself.